Traditional mortgage brokers have long been an important part of the mortgage application process. By using their knowledge they promise to help guide customers to the best mortgage offer based upon their individual circumstances. And things haven't changed all that much for a while. But there’s a new breed of websites and apps emerging which aim to “cut out the face-to-face middle-man” and help customers find the best mortgage offer at the touch of a button. But can they ever really compete with a human mortgage adviser's personal touch and judgment? We take a look at the new breed to FinTech's shaking up the mortgage broker market. What does a traditional mortgage broker do? Finding a mortgage can be difficult when there are hundreds of potential mortgage options and offers on the market. A mortgage broker helps to make things easier during what can be a stressful time by helping find the best value mortgage deal. They're also able to guide you to mortgage lenders who want your business (for example, non standard mortgages). They can also help to find deals which you might otherwise have been unable to access. For example, Atom Bank's Digital Mortgages are currently only available via brokers they work with (you can't apply direct). How are the new breed of brokers different? Dealing with a mortgage broker has traditionally been done via a face-to-face meeting. Arranging a home visit, or travelling to a broker’s office can be time-consuming, require advanced planing, and involves a lengthy “interview” / fact find process to determine mortgage suitability. Then there’s the mountain of paperwork to fill in, and the waiting around for several parties to communicate with one another. In a world where we can live, bank and shop online, instantly, the way mortgages have been bought does look a tad archaic...or ripe for innovation as the companies below would say! The new breed of mortgage advisers are essentially easy to use websites which can make a judgment on which mortgage offer suits a customer in real-time. Some go a little further and can even help process the mortgage application. Crucially, they can be filled in at the customer’s convenience, and they’re often very transparent with regards to pricing, the range of products they search, and in general, trying to make the buying process a little more customer-centric and frictionless. Some digital mortgage brokers will even inform the customer if there is a better mortgage available which it does not have access to, or alert a customer if a better deal shows up before they complete. This may sound simple and to a degree common sense, but it's a bit of a leap when it comes to mortgage buying. So, who is offering these services? There are now several companies aiming to bring the online mortgage broker process to millions of consumers. Below are three firms helping to shake-up the traditional mortgage buying process. Trussle was founded in 2015 by a mortgage analyst who found the house-buying process frustrating. So he built Trussle, which handles new mortgages as well as remortgages, searching “thousands” of deals in seconds. Buyers just fill out the user-friendly questionnaire "in around 10 minutes” and Trussle finds the best deal based on affordability and eligibility. Trussle can even show properties from Zoopla (which part-owns Trussle) based on the mortgage amount being sought and the desired location. The "Trussle Timeline" is a clear way of showing a customer how far along their application is, and having been around the longest, Trussle is feature-rich, going much of the way to completely replacing any human contact. 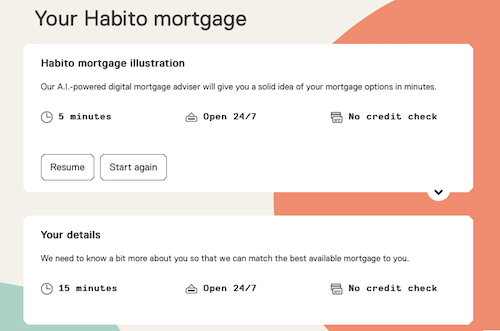 Habito founder Daniel Hegarty’s details were entered incorrectly by his mortgage adviser, leading to delays in his application which nearly cost him his dream home. So he wen't off and built Habito! With the aim of putting customers, not lenders first. Working in a very similar fashion to Trussle, Habito employs an AI-driven chatbot to explore the customer’s eligibility. For example, it asks questions like: “Do you have any credit card debts?” Employing a human-like approach makes the process feel more engaging, though like Trussle, Habito still relies on a human adviser to qualify any offers. Burrow (formerly known as Dwell Mortgages) is a tool which gives customers a “mortgage report” - a detailed view showing how much each lender will allow them to borrow, as well as the rates they're willing to lend, making it clear which mortgage works out to be the cheapest based on the monthly payments required. It rolls all of this data up into a "mortgage score" not unlike a credit score, which gives the customer an idea as to how likely they will be accepted for a mortgage. Without the reassuring human, this is pretty innovative, as it helps to manage customer expectations. Like the others, nearly all of the documentation is online, Again, there is still a pinch of human interaction, but it surely won't be long until the process is fully automated. 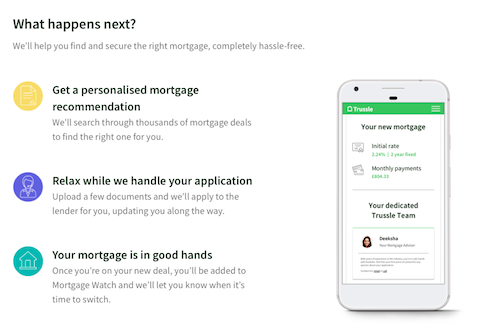 It might not cut out all of the traditional middle-man, but managing a mortgage through their app has a modern feel and would likely better appeal to a large swathe of consumers. Is a digital mortgage broker better than a traditional broker? Some customers might feel that mortgage advice can only truly be done by a human, but in the same way some of the most exciting new banks are branchless (and to some extent, faceless), mortgages might just be headed the same way. The greatest draw of an digital mortgage broker seems to be convenience...searching the market at your own leisure, just as online shopping has transformed the retail experience. Digital brokers also claim that computers “search the market” (essentially - query a database) better than any human, though with many of them still employing some degree of human decision making, it seems customers might get the best of both worlds. In the coming years, the growth of digital mortgage brokers should result in lower fees for consumers as the lower operating costs of digital brokers are theoretically the biggest threat to traditional mortgage brokers. But at present the real benefit is the faster, more streamlined, and generally slicker customer experience. Many of the digital mortgage brokers can also handle complex searches, such as inconsistent incomes or mortgages for self build properties which have been generally were mortgage brokers can add the most value. With customers still placing value in human interaction, traditional mortgage brokers probably won’t go away anytime soon, but more competition should help all UK consumers in the medium term. With more and more of these digital mortgage brokers popping up, we’re excited to see how quickly they'll be able to change the industry and how that drives the face-to-face brokers to innovate and improve their digital offerings. Have you already used Habito, Trussle, or another digital broker? Write a digital mortgage broker review of your own and help other people decide if they should consider this new breed of firms for their next mortgage! As part of this year's British Bank Awards - launching on 6th November, we're adding a category for "Best Mortgage Adviser" so get ready to share your experiences, and help us find the UK's best mortgage adviser.